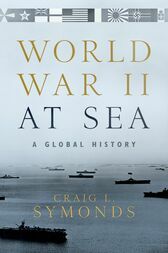 Author of Lincoln and His Admirals (winner of the Lincoln Prize), The Battle of Midway (Best Book of the Year, Military History Quarterly), and Operation Neptune, (winner of the Samuel Eliot Morison Award for Naval Literature), Craig L. Symonds has established himself as one of the finest naval historians at work today. World War II at Sea represents his crowning achievement: a complete narrative of the naval war and all of its belligerents, on all of the world's oceans and seas, between 1939 and 1945.Opening with the 1930 London Conference, Symonds shows how any limitations on naval warfare would become irrelevant before the decade was up, as Europe erupted into conflict once more and its navies were brought to bear against each other. World War II at Sea offers a global perspective, focusing on the major engagements and personalities and revealing both their scale and their interconnection: the U-boat attack on Scapa Flow and the Battle of the Atlantic; the "miracle" evacuation from Dunkirk and the pitched battles for control of Norway fjords; Mussolini's Regia Marina-at the start of the war the fourth-largest navy in the world-and the dominance of the Kidö Butai and Japanese naval power in the Pacific; Pearl Harbor then Midway; the struggles of the Russian Navy and the scuttling of the French Fleet in Toulon in 1942; the landings in North Africa and then Normandy. Here as well are the notable naval leaders-FDR and Churchill, both self-proclaimed "Navy men," Karl Dönitz, François Darlan, Ernest King, Isoroku Yamamoto, Erich Raeder, Inigo Campioni, Louis Mountbatten, William Halsey, as well as the hundreds of thousands of seamen and officers of all nationalities whose live were imperiled and lost during the greatest naval conflicts in history, from small-scale assaults and amphibious operations to the largest armadas ever assembled.Many have argued that World War II was dominated by naval operations; few have shown and how and why this was the case. Symonds combines precision with story-telling verve, expertly illuminating not only the mechanics of large-scale warfare on (and below) the sea but offering wisdom into the nature of the war itself. Craig L. Symonds is Ernest J. King Distinguished Professor of Maritime History at the U.S. Naval War College and also Professor Emeritus at the U.S. Naval Academy where he taught for thirty years and served as Department Chair.